Located at Phutthamonthon district, Nakhon Pathom Province. The park was created in 1957 (BE 2500) on the basis of an idea of Thailand's prime minister, Phibunsongkhram. This is a beautiful and peaceful park. The main attraction of this park is the 15.87m standing Buddha statue which is considered to be the highest free-standing Buddha statue of the world. 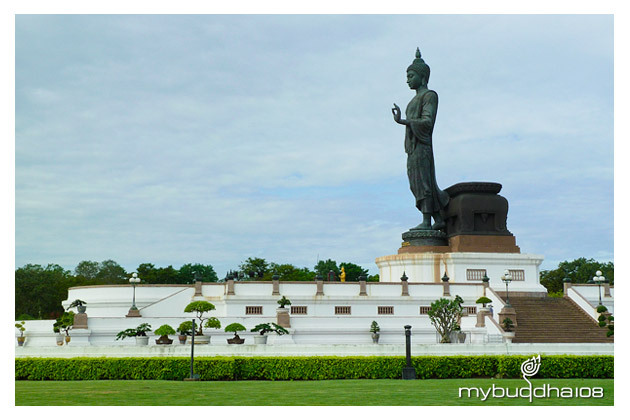 Construction started on July 29 1955, and the park was inaugurated on the Visak Bucha day (May 13) in 1957. After a long pause construction on the park resumed in 1976; notably, the main Buddha statue was built after that time. Already designed in 1955 by art professor Silpa Bhirasri, the statue was cast in 1981. Given the name Phra Si Sakkaya Thotsaphonlayan Prathan Phutthamonthon Suthat by King Bhumibol Adulyadej, it is located at the center of the park. Around the statue are sites memorializing the four main stations in the life of Buddha.